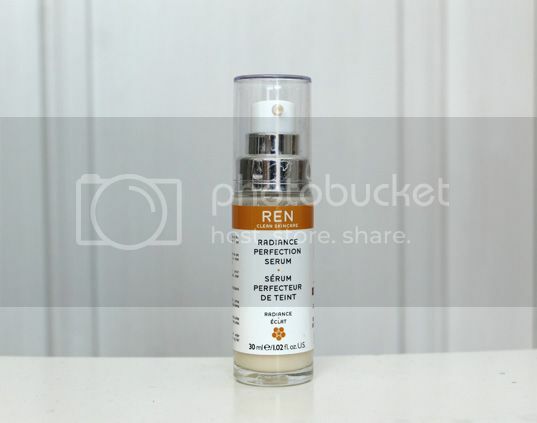 One of my greatest skin concerns is uneven skin tone and hyperpigmentation so I’m always on the lookout for a product to help with that and on my quest I came across the REN Radiance Range. They have quite a wide selection of products promising a renewed, radiant complexion, from cleansers to BB creams. I almost opted for the Glycolactic Radiance Renewal Mask, but given my past history with face masks I’m not sure if my skin might be a little too sensitive so I chose the Radiance Perfection Serum. – Glabridin (from Liquorice), Tyrosinase Inhibitors (from Wild Canadian Rumex) and Vitamin C (from Ascorbyl Lipovector) which work together to brighten hyperpigmentation. – Hyaluronic Acid to ‘plump’ and intensively hydrate skin. – Papain to help exfoliate the skin and reduce inflammation. It contains no Parabens, Sulphates, Mineral Oil, Silicones or synthetic fragrances which if you’re conscious about what you put on your skin is a bonus! It’s quite a light textured serum, but I find it does take a little longer than other serums to sink in so my skin feels tacky for a good 5-10 mins. This means I can’t really use it if I’m in a rush, which lets it down to be honest as it’s meant to be a serum that’s used daily and often I can’t because my time is limited when I’m getting ready for work in the morning. However I do find when I apply this serum under my makeup my skin seems to look more radiant, even and have a lovely healthy youthful glow which I absolutely love, so whenever I’m getting ready for a night out I always use the serum before applying my makeup. I can’t honestly really say if this serum has been the main factor but I have noticed over the past few months that I’ve been using it that the dark marks are fading on my face. However I don’t know if that is just down to regular exfoliation and time (two of the most important things when trying to fade dark marks) as opposed to use of this serum because I haven’t used it as regularly as I’d have liked. As for the price, at £35 for 30ml it is on the expensive end of the scale, but I do think it’s worth the price and I think I would buy it again. It has the most potent blend of ingredients that I’ve seen, it’s free from a lot of nasties and in spite of a little tackiness when first applied, I definitely notice an immediate difference when I’m wearing this. Any long term benefits can only be the icing on the cake and I think for those who have the time to apply this regularly (read: more than once a week) then I think you would definitely see some improvement.